The first white settlers arrived in what is present day Washington County in the 1760's. Abingdon, Va. was known as Wolf Hills before "Abingdon" was selected as the name of the county seat. Washington County was formed from Fincastle County in 1777, the county seat, Abingdon was formed in 1778. The original Washington County, VA in addition to containing some of the other present day surrounding counties also contained what is today, Sullivan County, TN. 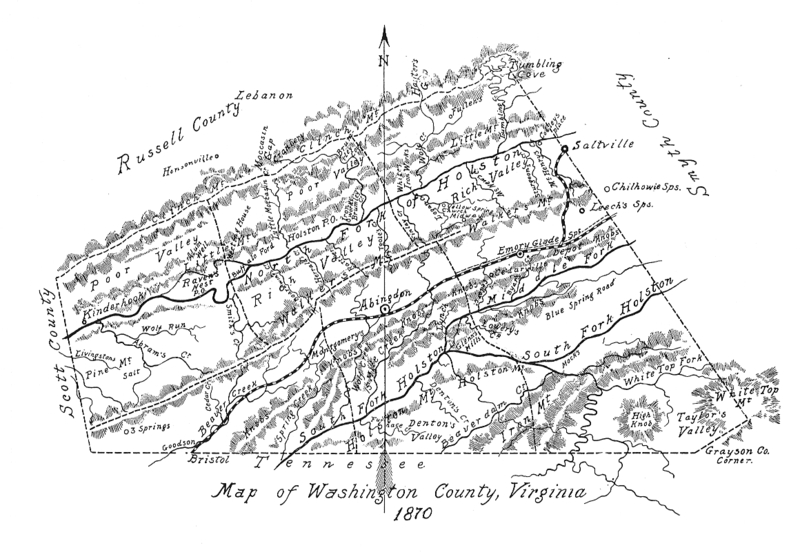 In 1786 the northwestern part of Washington County became Russell County. In 1814 the western part of what remained of Washington County was combined with parts of Lee County and Russell County to form Scott County. In 1832 the northeastern part of Washington County was combined with part of Wythe County to form Smyth County. With the incorporation of the town of Goodson as the independent city of Bristol in 1890, Washington County assumed its present size. Marriage records begin in 1782 for Washington County, VA. Deeds begin in 1778. Wills and Estate records begin in 1777. There are no chancery or law orders prior to 1831. Court orders can be found in court minutes, which begin in 1777. Birth and death records 1853-1896 and after 1912. A History of The Middle New River Settlements and Contiguous Territory. installed on March 5th, 1998.